The early Christian writers Tertullian and Origen mention the existence of a British Church in the third century AD and in the fourth century British bishops attended a number of councils, such as the Council of Arles in 314 and the Council of Rimini in 359. The first member of the British church whom we know by name is Saint Alban, who, tradition tells us, was martyred for his faith on the spot where St. Albans Abbey now stands. The British Church was a missionary church with figures such as St Illtud, St Ninian and St Patrick evangelising in Wales, Scotland and Ireland, but the invasions by the pagan Angles, Saxons and Jutes in the fifth century seem to have destroyed the organisation of the Church in much of what is now England. In 597 a mission sent by St Gregory the Dialogist and led by St Augustine of Canterbury landed in Kent to begin the work of converting these pagan peoples. What eventually became known as the "Church of England"  was the result of a combination of three traditions, that of Augustine and his successors, the remnants of the old Romano-British traditions and the Celtic tradition coming down from Scotland and associated with people like St Aidan and St Cuthbert. These three traditions came together as a result of increasing mutual contact and a number of local synods, of which the Synod of Whitby in 664 has traditionally been seen as the most important. The result was an English Church, led by the two Archbishops of Canterbury and York, that was fully assimilated into the mainstream Church. This meant that it was influenced by the wider development of the Christian tradition in matters such as theology, liturgy, church architecture, and the development of monasticism. Regarding the British Isles, what is known about the state of the Church there at the time of the Great Schism is that subsequent to the Norman Invasion in 1066, Church life was radically altered. Native clergy were replaced, liturgical reform enacted, and a strong emphasis on papal church control was propagated. As such, it is probably safe to say that, prior to 1066, the church of the British Isles was Orthodox, and the Normans brought the effects of the Great Schism to British soil. As such, it is probably proper to regard King Harold II as an Orthodox Christian. It also meant that after King Harold II, the English Church continued under the authority of the "Pope" and not with Orthodoxy and this article does not consider the historical development of the "Church of England" after this date. Orthodoxy was reintroduced, by the Church of Greece and by Russia. The greatest contributor towards documenting the ecclesiastical and political history of England is attested to St. Bede, who completed in 731 five volumes of his best known work The Ecclesiastical History of England. 55 BC Julius Caesar's first expedition to Britain, gaining a foothold on the coast of Kent. 54 BC Julius Caesar's second invasion of Britain, resulting in many of the native celtic tribes paying tribute and giving hostages in return for peace. 5 AD Rome acknowledges Cymbeline, King of the Catuvellauni, as king of Britain. Apostle Simon the Canaanite and Zealot. In these Islands, the Celtic Church had shone forth - especially during the glorious period known as the "Age of Saints" when its missionaries preached throughout much of Europe, becoming 'Equals to the Apostles'. Apocryphal legend claims that Joseph of Arimathea accompanied the Apostle Philip, Lazarus, Mary Magdalene & others on a preaching mission to Gaul. Eusebius of Caesarea, (AD 260-340) Bishop of Caesarea and father of ecclesiastical history wrote: "The Apostles passed beyond the ocean to the isles called the Britannic Isles." Ireland had been a place of refuge for monks fleeing from iconoclastic persecution; so, later, it was referred to as "the New Thebais" on account of the number of its monasteries. 43 Roman Emperor Claudius conquers England at Richborough (Kent), making it part of the vast Roman Empire; London is founded. 51 Caratacus, British resistance leader is captured and taken to Rome. 61 Boudicca, queen of the Iceni, led uprising against the Roman occupiers but was defeated and killed by the Roman governor, Suetonius Paulinus. 63 Joseph of Arimathea, travels to Britain and lands in Glastonbury  on the first Christian mission to Britain; Aristobulus, consecrated as first bishop to Britain. ca.75-77 The Roman conquest of Britain is complete, as Wales is finally subdued; Julius Agricola is imperial governor (to 84). 122 Construction of Hadrian's Wall. 133 Julius Severus is sent to Palestine to crush the revolt. ca. 170-236 Hippolytus of Rome  identifies Apostle Aristobulus listed in Romans 16:10 with Joseph of Arimathea and states that they ended up becoming Shepherds of Britain. 180 Protomartyr of Wales, St. Dyfan of Merthyr martyred at Merthyr Dyfan, Wales, May 14. 208 Tertullian writes that Christ has followers on the far side of the Roman wall in Britain where Roman legions have not yet penetrated. 283-305 Protomartyr of England, St. Alban , June 22. 313 "Edict of Toleration" (Milan), Christianity is made legal throughout the empire. 314 Council of Arles, for the first time, three British bishops attend a council. 325 First Ecumenical Council of Nicea convened by the Roman Emperor Constantine. 350 Ninian establishes the church Candida Casa at Whithorn in Galloway, Scotland, beginning the missionary effort to the Picts. 380 Pelagius  enters Britain from Rome and introduces the Heresy of Pelagianism. 390 Patrick born at Kilpatrick, Scotland. 395 Death of Theodosius, the last emperor to rule an undivided empire, leaving Arcadius, emperor in the East and his other son, Honorius, emperor in the West; the office of Roman Emperor changes from a position of absolute power to one of being merely a head of state. 403 Abduction of Patrick to Ireland to serve as a slave; Victricius, Bishop of Rouen, visits Britain for the purpose of bringing peace to the island's clergy, who were in dispute over the Pelagian heresy. 406 Invasion of Gaul by Germanic tribes, severing contact between Rome and Britain . 410 Probable end of Roman occupation of Britain; Pelagian is driven out of Britain by the Goths of Alaric and moves to Palestine. 412 Patrick of Ireland has a vision of God informing him that he will leave for Ireland. 419 King Brychan of Brecknock born, circa 419, in South Wales. 429 Celestine I dispatches prominent Gallo-Roman Bishops Germanus of Auxerre and Lupus of Troyes to Britain as missionary bishops and to combat the Pelagian heresy. 430 Patrick ordained by St. Germannus, Bishop of Auxerre. 432 Patrick sent from Aesir in Gaul to mission to Ireland. 440 Materiana born in Gwent of Wales. 445 Founding of monastery at Armagh in northern Ireland. 447 Germannus returns to Britain with Severus and heals a lame youth, condemns Pelagian heretics. 450 First monasteries established in Wales; Anglo-Saxon invasion of Britian. 455 Germanic Saxons and Angles conquer Britain, founding several independent kingdoms. 484 Brendan the Navigator born at Tralee in Kerry, Ireland. 493 Gildas the Wise born in the lower valley of the Clyde in central Scotland . 525 Repose of St. Brigid of Kildaire, February 1; Gildas the Wise studies under St. Illtyd and travels to Ireland with David of Wales and Cadoc, here he is ordained to the priesthood. 540 Kentigern appointed bishop to Strathclyde Britons (modern Glasgow). 545 Synod of Brefi at Llandewi Brefi in Wales condemns Pelagianism; Saint David of Wales moved the Primatial See of Britain from Caerleon to Menevia (St. David's). 547 Saint David of Wales does obeisance to the Patriarch of Jerusalem. 550 Repose of St. Jarlath of Tuam, first Bishop of Tuam, June 6; Aed of Ferns born at Inisbrefny, Ireland. 553 Kentigern, Bishop of Glasgow and Strathclyde exiled by pagans fleeing to Menevia, Wales. 556 Columba founds monastery of Durrow in Ireland. 560 Gildas the Wise returns to Ireland at the invitation of King Ainmeric. 563 Columba arrives on Iona and establishes monastery there, founding mission to the Picts. 569 David of Wales holds Synod of Victoria to re-assert the anti-Pelagian decrees of Brefi. 570 Repose of Gildas the Wise, January 29, his relics allowed to drift; relics of Gildas the Wise recovered and translated to the church in Rhuys, April 29. 573 Kentigern returns to Scotland after exile; Kentigern evangelises Galloway and Cumberland. 580 Aedan of Ferns returns to Ireland after studying under Saint David of Wales in Wales. 581 Kentigern returns to Glasgow. 577 Repose of St. Brendan the Navigator, May 16. 587 Repose of St. David of Wales, March 1. 597 Repose of Columba of Iona, enlightener of Scotland, June 9. According to historians, during this period St. Non, the mother of St. David of Wales, and the daughter of the nobleman Cynyr of Caer Goch of Pembrokeshire, reposed and St. Materiana of Cornwall, April 9, reposed early 6th-century at Minster of Cornwall. 597 Gregory the Great sends Augustine  and forty monks to Britain to convert the Kingdom of Kent; Augustine first preaches in the Isle of Thanet to King Ethelbert, receiving license to enter the Kingdom of Kent; King Ethelbert is converted and on Christmas day 10,000 of the king's subjects were baptized; Augustine was consecrated Abp. at Arles, and establishes the See of Canterbury. 598 Brandon mac Echac (d. 603) convence a synod at which the Diocese of Ferns is made an episcopal see and Aedan of Ferns is made the first Bishop; Glastonbury Abbey founded; the Church in the British Isles numbers 120 bishops, hundreds of monasteries and parishes organized under a Primate with his See at Menevia. 7th century Celtic missions are launched in Northumbria (Aidan, Cuthbert). 602 Augustine repairs the church of our Saviour and builds the monastery of St. Peter the Apostle, "Peter" is the first abbot of the same. 603 Repose of Kentigern of Glasgow, January 11; Ethelfrid, king of the Northumbrians, having vanquished the nations of the Scots, expels them from the territories of the English. 604 First Bishop of London, Mellitus consecrated by Augustine in the province of East Saxons; Repose of Saint Augustine of Canterbury "Apostle to the English" May 26; Saint Laurence of Canterbury consecrated as the second Archbishop of Canterbury; Bp. Mellitus founded the first St. Paul's Cathedral, traditionally said to be on the site of an old Roman Temple of Diana (although Christopher Wren in the 17th c. found no evidence of this). 612 Repose of Dubricius of Caerleon, Archbishop of Caerleon and Wales, November 14. 618 Repose of abbot Donnan & his monk companions in Eigg, April 17. 619 Repose of Laurence of Canterbury, February 3; Mellitus consecrated as third Archbishop of Canterbury. 624 Repose of Mellitus , first Bishop of London, April 24. 628 Benedict Biscop born in Northumbria. 630 Audrey of Ely born in West Suffolk. 632 Repose of Aed of Ferns,  Bishop of Ferns in Ireland, January 31. 635 Cuthbert born in Britain. 640 Repose of Beuno the Wonderworker, Abbot of Clynnog, April 21 . 647 Repose of Felix of Burgundy, Apostle of East Anglia, March 8. 651 Cuthbert of Lindisfarne witnesses the soul of St. Aidan of Lindisfarne reposing as a light in the night sky and leaves for Melrose Abbey to become a monk; Repose of St. Aidan of Lindisfarne, enlightener of Northumbria of Northern England, August 31. 653 Benedict Biscop and Wilfred the Elder set off to visit Rome. 661 Cuthbert of Lindisfarne and Eata join a monastery at Ripon. 664 Synod of Whitby; Cuthbert stricken by the great pestilence; repose of St. Boisil, abbot of Melrose Abbey, Scotland, February 23 . 668 Gerald of Mayo follows Colman and settles in Innisboffin. 669 Theodore of Tarsus arrives in Kent at the age of seven. 670 Colman founds an English monastery, separate to the irish, the "Mayo of the Saxons", with Gerald of Mayo as the first abbot. 672 Repose of Chad of Lichfield and Mercia, March 2. 676 Cuthbert becomes a solitary on Farne Island. 679 Repose of Audrey of Ely. 680 Repose of Botolph of Iken, June 17; Repose of St. Hilda of Whitby, November 17; Sussex is the last part of England to be converted to Christianity. 686 Repose of Cuthbert of Lindisfarne, March 20. 689 Repose of Benedict Biscop, abbot, in Wearmouth, Co Durham, January 12. 694 Repose of Sebbe, founder of the monastery of Westiminster. 693 Repose of Erconwald, Bishop of London. 696 Incorrupt body of Audrey of Ely found. 697 Gerald of Mayo resigns as abbot of the "Mayo of the Saxons" in favour of St. Adamnan; Relics of Cuthbert of Lindisfarne revealed to be incorrupt. 703 Gerald of Mayo resumes the abbacy of the "Mayo of the Saxons". 709 Repose of Wilfrid, Bishop of Hexham, April 24. 714 Repose of Guthlac of Crowland, the hermit, April 11. 716 Repose of Donald of Ogilvy, confessor of Scotland, July 15..
735 Repose of Venerable Bede, May 25. 869 King Edmund of East Anglia, martyred November 20. 870 Repose of Ss. Beocca and Hethor, the two martyrs of Chertsey. 890 Bede's Ecclesiastical History was translated into Old English at the insistence of Alfred the Great. 899 Repose of King Alfred the Great, October 26. 903 Relics of King Alfred the Great  translated to New Minster Abbey. 934 Death of Birnstan of Winchester. 935 Relics of St. Branwallader (or Brelade translated by King Athelstan to Milton Abbey . 955 Repose of King Edred of England, November 23. 988 Repose of St. Dunstan of Canterbury, Bishop of London. ca.988-1023 The "Bosworth Psalter" is compiled at Canterbury, including a calendar of the Orthodox Church from among the Saints of Western, especially English origin who reposed before the West fell away from Orthodoxy. 1002 Repose of St. Wulsin, renewer of the Monastery of St. Peter. 1012 Repose of St. Alphege, Archbishop of Canterbury martyred to the east of London at Greenwich, April 19. 1030 Relics of St. Boisil (Boswell), Prior of Melrose (+661), are translated to Durham Cathedral by the priest Ælfred. 1066 Repose of the last Orthodox King of England, Harold of England, October 14. 1072 On October 15, the last English Orthodox bishop, Ethelric of Durham, after anathematizing the Pope, died in prison at Westminster. 1104 Relics of Cuthbert of Lindisfarne translated  from Lindisfarne to Durham Cathedral, September 4.
ca.1136 Geoffrey of Monmouth writes his chronicle Historia Regum Britanniae ("History of the Kings of Britain"). This period witnessed the continual struggle between the English Kings and the Church in Rome for the legal high ground. 1170 Abp. of Canterbury Thomas Becket is assassinated in December in Canterbury Cathedral, after having excommunicated the Abp. of York and the Bps. of London and Salisbury, who had held the coronation of Henry the Young King in York in June, in breach of Canterbury's privilege of coronation. 1202-04 Nobleman Simon de Montfort, 5th Earl of Leicester achieved prominence in the Fourth Crusade. 1215 Magna Carta is issued, arguably the most significant early influence on the extensive historical process that led to the rule of constitutional law and democracy today in the English speaking world. ca.1220 English Bp. Richard Le Poore is said to have been responsible for the final form of the "Use of Sarum", which had the sterling reputation of being the best liturgy anywhere in the West. 1221 The Dominican Friars (known as Black Friars) arrive in England, appearing in Oxford. 1265 Simon de Montfort, 6th Earl of Leicester calls the first English parliament. 1295 King Edward I summons the Model Parliament, including members of the clergy and the aristocracy, as well as representatives from the various counties and boroughs. 1337-1453 Hundred Years' War between England and France. 1347 Death of William of Ockham, English Franciscan friar and scholastic philosopher and a supporter of the doctrine of Apostolic poverty, which was held by fundamentalist Franciscan and mendicant orders, bringing them into conflict with the pope; also the author of Occam's Razor. 1349 Death of Richard Rolle, English religious writer and mystic, Bible translator, and hermit. 1393 Julian of Norwich, thought of as one of the greatest English mystics, writes The Sixteen Revelations of Divine Love, chronicling her prolonged states of ecstasy when she saw visions of the sufferings of Christ and of the Trinity. 1438 Margery Kempe, a "religious enthusiast" and laywoman, completes her autobiography The Book of Margery Kempe, chronicling her spiritual experiences, visions, and extensive pilgrimages to various holy sites in Europe. 1453 The Hundred Years War ends, England loses all its territory in France except for Calais. 1455-1485 Wars of the Roses, a series of dynastic civil wars between supporters of the rival houses of Lancaster and York, for the throne of England. 1476 William Caxton introduces the printing press into England, setting up a press at Westminster; the first book known to have been issued there was an edition of Chaucer's Canterbury Tales. 1521 Pope Leo X rewards King Henry VIII for his written attack on Luther by granting him the title "Defender of the Faith". 1534 Act of Supremacy by which the Parliament of England declared King Henry VIII as 'the only supreme head on earth of the Church in England', and affirming the legal sovereignty of the civil laws over the laws of the Church in England. 1536-1541 Dissolution of the Monasteries, nunneries and friaries in England, Wales and Ireland. 1549 First Book of Common Prayer is introduced. 1550 Vestments controversy begins as John Hooper called for the elimination of vestments; the controversy was ostensibly concerning vestments, but more fundamentally concerned with English Protestant identity, doctrine, and various church practices, shedding much light on the development of English forms of Puritanism and Anglicanism. 1553-1558 Restoration of Roman Catholicism by Queen Mary I; Queen Mary I restored the Sarum rite in 1553 and promulgated it throughout England, but it was finally abolished by Elizabeth I in 1559. 1558-1603 Elizabethan Era, final break with the Roman Church. 1560 Scottish Reformation marks Scotland's formal break with the Papacy in 1560; the Reformation Parliament repudiated the pope's authority, forbade the celebration of the Mass and approved a Protestant Confession of Faith, being made possible by a revolution against French hegemony. 1563 The Thirty-Nine Articles of Religion were established, the historic defining statements of Anglican doctrine in relation to the controversies of the English Reformation. 1564-1660 The Era of Puritanism. 1649-1660 Interregnum: Commonwealth of England: Anglicanism was disestablished and outlawed, and in its place, Presbyterian ecclesiology was introduced in place of the episcopate; the 39 Articles were replaced with the Westminster Confession, and the Book of Common Prayer was replaced by the Directory of Public Worship. Anglicanism was restored in a form not far removed from the Elizabethan version. However the ideal of encompassing all the people of England in one religious organisation, which was taken for granted by the Tudors, had to be abandoned. The religious landscape of England assumed its present form; the Anglican was the established church occupying the middle ground; Roman Catholics and those Puritans and Protestants who dissented from the Anglican establishment, too strong to be suppressed altogether, had to continue their existence outside the National Church rather than controlling it. 1662 Major revision of the Book of Common Prayer is published, remaining the official prayer book of the Church of England up until the 21st century (when an alternative book called Common Worship largely displaced it in Anglican parishes). 1670 Archdiocese of Thyateira and Great Britain established by priest Daniel Voulgaris first Greek Orthodox Community in London, re-establishing an Orthodox presence in Great Britain. 1676 Arrival of Joseph Georgerines, Archbishop of Samos. 1684 "Greek St Church to the Panagia" confiscated and handed over to Huguenot refugees from France. Archdiocese of Thyateira and Great Britain forced to worship for the next 150 years in the Imperial Russian Embassy. 1688 The Glorious Revolution (Revolution of 1688), overthrew King James II of England (VII of Scotland and II of Ireland) by a union of Parliamentarians with an invading army led by William III of Orange-Nassau. 1689 Act of Toleration, partially restores civil rights to Nonconformists who dissented from the Church of England, such as Baptists and Congregationalists, allowing them their own places of worship and their own teachers and preachers, subject to acceptance of certain oaths of allegiance; however this did not include Roman Catholics, Quakers or non-trinitarians. 1700 The Parliament of England passed Popery Act 1698, intended to prevent the Growth of Popery, imposing a number of penalties and disabilities on Roman Catholics in England. 1738 Print 'Noon'  by William Hogarth shows evidence of a crowd exiting a Greek Orthodox church. 1778 The Parliament of Great Britain enacted the Papists Act 1778, the first Act for Roman Catholic Relief, reversing some of the penalties imposed in Popery Act 1698. 1780 The Gordon Riots, an anti-Catholic uprising against the act of 1778, which became an excuse for widespread rioting and looting. 1827 A Byzantine silk depicting the Earth and the Ocean was found in the tomb of St. Cuthbert Bp. of Lindisfarne, when it was uncovered in May at Durham; the personified Earth is shown emerging from the waters with ducks and fishes, fishing being an allegory in Church art of apostolic mission of preaching the Gospel. 1837 Imperial Russian Embasy offers hospitality in Finsbury Park, London to the Archdiocese of Thyateira and Great Britain community for their religious activities. ca. 1840-1927 St. Arsenios of Cappadocia prophesised that "The Church in the British Isles will only begin to truly grow again when it begins to venerate once more its own saints". 1850 Greek Orthodox church built in London Street in the City. 1868 Tsar Nicholas Alexandrovich Romanov born May 6. 1877 Greek Orthodox Church of the Divine Wisdom (St Sophia) in Bayswater built. 1899 Bede is made a "Doctor of the Church"  by Leo XIII. 1906 Greek Orthodox Church of Saint Nicholas built in Cardiff. 1908 Oecumenical Patriarchate transfers its rights for four Greek Orthodox community churches to Church of Greece. 1914 By this time in Great Britain there existed four thriving Greek Orthodox Communities, all centred around a Greek Church of their own: London (Saint Sophia), Manchester (The Annunciation), Liverpool (Saint Nicholas), and Cardiff (Saint Nicholas). 1918 The family of Tsar Nicholas, Alexandra and their five children are lined up in their basement and shot, July 16. 1922 Holy Synod of the Oecumenical Patriarchate recognises the Archdiocese of Thyateira and Great Britain with London as its seat; Germonos (Strinopoulos), former Rector of the Halki Theological Academy, is chosen as the first Bishop and Metropolitan of Thyateira. 1941 Death of Evelyn Underhill, an English Anglo-Catholic writer and pacifist known for her numerous works on religion and spiritual practice, in particular Christian mysticism. 1948 HRH Princess Elizabeth, the present Queen, married the Greek Orthodox Prince Philip, the present Duke of Edinburgh; he was officially required to cease to be Orthodox, although he never ceased to make the Orthodox sign of the cross in public. 1951 Death of Germonos (Strinopoulos); Succeeded by Abp. Athenagoras (Cavadas). 1958 Elder Sophrony (Sakharov) seeks a monastic life in Essex of London; Timothy Ware converted from the Church of England to the Greek Orthodox Church. 1959 Patriarchal Stavropegic Monastery of St. John the Baptist founded by Elder Sophrony in Tolleshunt Knights, Maldon, Essex under the jurisdiction of Metr. Anthony (Bloom) of Sourozh. 1962 Repose of Athenagoras (Cavadas); Diocese of Sourozh is founded by Metr. Anthony (Bloom) of Sourozh. 1964 Gregorios (Theocharous) appointed Chancellor of the Archdiocese of Thyateira. 1965 Patriarchal Stavropegic Monastery of St John the Baptist moved under the Ecumenical Patriarchate; Nicholas Couris ordained a priest for ROCOR in Ireland. 1966 Timothy Ware is ordained to the priesthood and tonsured as a monk, receiving the name Kallistos; repose of St. John Maximovitch, Archbishop of London July 2. 1970 Gregorios (Theocharous) consecrated Bishop of Tropaeou, December 12; Chrysostomos (Mavroyiannopoulos) made auxiliary Bishop of Kyanea, December 19; acquired in 1960, St. Luke's Greek Orthodox Church in Glasgow, Scotland, is elevated to a Cathedral by the Pope and Patriarch of Alexandria, Nicholas VI (Valeropoulos), with the blessing of the Ecumenical Patriarchate. 1973 Anglican-Orthodox dialogue began, when the Anglican-Orthodox Joint Doctrinal Discussions (A/OJDD) held its first meeting in Oxford. 1975 Repose of Metr. Nikolaos of Halkis in a London hospital; the Greek Orthodox community of Saint Panteleimon of Harrow is established; Abp. Athenagoras (Kokkinakis) publishes The Thyateira Confession: The Faith and Prayer of Orthodox Christians. 1976 The first phase of the Anglican-Orthodox dialogue was concluded by the publication of The Moscow Agreed Statemen. 1977 Death of Fr. Nicholas Couris; the New Oxford Annotated Bible with the Apocrypha - Revised Standard Version (Expanded Edition) is published, endorsed by Abp. Athenagoras (Kokkinakis) of Thyateira and Great Britain. 1978 Diocese of Sourozh buys the Cathedral of the Dormition and All Saints, in London's Ennismore Gardens. 1979 Repose of Abp. Athenagoras (Kokkinakis) succeeded by Abp. Methodios (Fouyias); Kallistos (Ware) of Diokleia appointed. 1980 The Antiochian Orthodox Society is established to serve the Arabic speaking and believing community. 1981 Redundant Anglican Church of St. Mary in Mary Street, Dublin handed to the Greek Orthodox Community of Dublin and Ireland, blessed and dedicated to the Holy Annunciation by Abp. Methodius (Fouyias of Thyateira, Great Britain and Ireland, May 24. 1982 Kallistos (Ware) of Diokleia consecrated as Bishop for the Thyateira and Great Britain; the Church of St. Edward the Martyr is founded in Brookwood, Surrey, England, under the authority of (OODE note: Schismatic) Metr. Cyprian of Oropos and Fyli , to care for the sacred relics of Saint Edward the Martyr. 1984 The second phase of the Anglican-Orthodox dialogue was concluded with the publication of The Dublin Agreed Statement. 1988 Abp. Methodios (Fouyias) is succeeded by Abp. Gregorios (Theocharous) who is elected Abp. of Thyateira and Great Britain and enthroned at the Cathedral of Sophia in West London, April 16. 1989 The third phase of the Anglican-Orthodox dialogue began, when the commission was re-constituted as The International Commission for Anglican-Orthodox Theological Dialogue (ICAOTD), under the chairmanship of Metr. John of Pergamon and Bp. Henry Hill (succeeded in 1990 by Bp. Mark Dyer). 1990 The Friends of Mount Athos society is formed by people sharing a common interest for the monasteries of Mount Athos, with Metr. Kallistos (Ware) of Diokleia being the President of the society, also including Prince Philip (Duke of Edinburgh) and Prince Charles (Prince of Wales and Heir Apparent to the British throne) among its members. 1991 The body of Nicholas II of Russia is exhumed in Yekaterinburg, Siberia. 1993 Death of Elder Sophrony (Sakharov), July 11. 1995 Death of Philip Sherrard, theologian May 30; establishment of the Antiochian Orthodox Deanery of the United Kingdom and Ireland. 1996 St. Aidan's Antiochian Orthodox Church in Manchester consecrated by Metropolitan Gabriel (Saliby); Richard Swinburne, Emeritus Professor of Philosophy at the University of Oxford and a very influential proponent of natural theology, converted from the Church of England to the Greek Orthodox Church. 1997 Friends of Orthodoxy on Iona founded. 1998 Nicholas II of Russia and family properly laid to rest. 1999 The Institute for Orthodox Christian Studies is founded in the ancient university city of Cambridge with the blessing of all Orthodox hierarchs in Western Europe, being a full member of the Cambridge Theological Federation; the Philokalia, Volume 4 published by Faber&Faber. 2000 Theodoritos (Polyzogopoulos) of Nazianzos elected and consecrated Bishop of Nazianzos; the council of Bishops of the Russian Orthodox Church unanimously recognise Nicholas, Alexandra and their five children as saints; Archdiocese of Thyateira annual Youth Conference held at Wood Green, North London, April 21; Monachos.net  online discussion community set up by M.C. Steenberg; Institute of Byzantine Studies established at Queens' University, Belfast, Ireland. 2001 Bishop Kallistos (Ware) of Diokleia retires. 2005 Mission in Macclesfield dedicated to St. Theodore of Canterbury opens in September. 2006 Bp. Basil (Osborne) was accepted into the jurisdiction of the Ecumenical Patriarchate on June 8 and accorded the title of Bishop of Amphipolis as head of the Episcopal Vicariate of Great Britain and Ireland, within the Patriarchal Exarchate for Orthodox Parishes of Russian Tradition in Western Europe. 2007 The Holy Synod of the Moscow Patriarchate officially released Bp. Basil (Osborne) from its jurisdiction on March 27; the Abp. of Canterbury Dr. Rowan Williams welcomed Patriarch Bartholomew I to Westminster Abbey to celebrate the publication of The Church of the Triune God: The Cyprus Agreed Statement, taking over 16 years to produce, concluding the third phase of the Anglican-Orthodox international theological dialogue; Diocese of Diokleia is elevated to a Metropolis and Bp. Kallistos (Ware) to Titular Metropolitan of Diokleia; Bp. Elisey of Sourozh consecrated; death of Metr. Gabriel (Saliby) of Western Europe (Antiochian). 2008 Enthronement of Metr. John (Yazigi) of Western and Central Europe for the Antiochian Orthodox Deanery of the United Kingdom and Ireland; partnership between Monachos.net (Patristic and Monastic website) and Ancient Faith Radio, launching a series of weekly internet podcasts entitled "A Word From the Holy Fathers". G. E. Palmer, Philip Sherrard and Bishop Kallistos Ware translate and publish four volumes of the Philokalia into English; Bishop Kallistos Ware and Mother Mary produced English translations of the Lenten Triodion and Festal Menaion. Grand Duchess St. Elizabeth (a grand-daughter of Queen Victoria and a great-aunt of Prince Philip) and St. John Maximovich, who have been associated with them in the recent past. Monastery of St. John the Baptist in Essex, which depends directly on the Oecumenical Patriarchate and whose Founder was the saintly Archimandrite Sophrony, a pupil of St. Silouanos of the Holy Mountain. ANASTASIS. The web pages of Archimandrite Ephrem Lash. Christianity in the United Kingdom: Eastern Orthodox Churches. Timeline of Anglo-Saxon settlement in Britain. Orthodox England (Russian Orthodox Church Outside Russia: Diocese of Great Britain and Ireland). Timeline of Orthodox Christianity in the British Isles. A SERVICE TO ALL SAINTS OF BRITAIN; AN ENGLISH ORTHODOX CALENDAR; DEATHBED PROPHECY OF KING EDWARD THE CONFESSOR. Timeline of British History at Britannia.com. 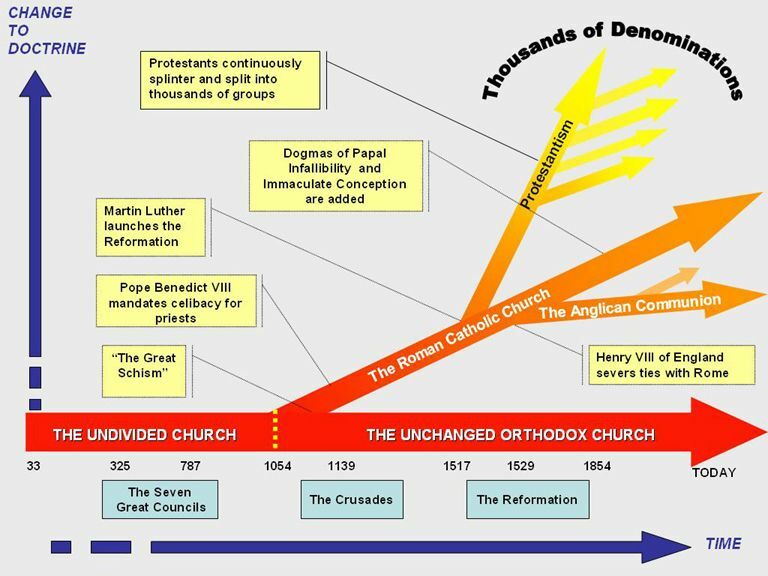 Timeline of the English Reformation and Development of the Anglican Church (1517-1726). Christianity in the UK at BBC News. 2. ↑ The British forces are led by Cassivellaunus. 3. ↑ St. Philip sent Joseph of Arimathea, with twelve disciples, to establish Christianity in the most far-flung corner of the Roman Empire: the Island of Britain. The year AD 63 is commonly given for this "event", with AD 37 sometimes being put forth as an alternative. 4. ↑ Tertullian wrote that Britain had received and accepted the Gospel in his life time: "All the limits of the Spains, and the diverse nations of the Gauls, and the haunts of the Britons--inaccessible to the Romans, but subjugated to Christ." 6. ↑ The Anglo-Saxon Chronicles list the year of St. Alban's execution as 283 not as 305. 8. ↑ The earliest authority for their existence is St. Gildas in De Excidio Britanniae. 9. ↑ Ss. Socrates and Stephanus appear in the Martyrologion Hieronymianum MS.50 from Trinity College, Dublin (11th-century) and one of the earliest amplifications of Bede's martyrology. Tradition holds them to be disciples of St. Amphibalus. 10. ↑ St. Jerome suggests that this Pelagius was of Scottish descent but in such terms that it is uncertain as to whether he was from Scotland or Ireland. He is also frequently referred to as a British monk and Augustine has been documented as referring to him as "Brito" to distinguish him from Pelagius of Tarentum. 12. ↑ In early January, 406, a combined barbarian force (Suevi, Alans, Vandals & Burgundians) swept into central Gaul, severing contact between Rome and Britain. In autumn 406, the remaining Roman army in Britain decided to mutiny. One Marcus was proclaimed emperor in Britain, but was immediately assassinated. 13. ↑ Emperor Honorius tells Britain to attend to its own affairs, effectively removing the Roman presence. 14. ↑ St. Auxilius of Ireland: The date of death is also given as 454 or 455, see Sabine Baring-Gould, The Lives of the Saints (J. Hodges, 1898), 275. 15. ↑ When he came to Ireland, as its enlightener, it was a pagan country; when he ended his earthly life some thirty years later, about 461, the Faith of Christ was established in every corner." (Great Horologion) The work of St Patrick and his brethren has been called the most successful single missionary venture in the history of the Church. 16. ↑ The date of St. Gildas' birth can only tentatively be placed to the decades either side of the beginning of the Sixth Century. St. Bede indirectly suggests the year 493 for this event and this is the date adopted for this article. 17. ↑ Saint Augustine of Canterbury is also called the "Apostle to the English". 18. ↑ The "St Augustine Gospels" manuscript is the oldest surviving Latin illustrated Gospel book in existence. 19. ↑ A bronze reliquary in which the relics of St. Aed of Ferns are kept is currently preserved in Dublin. 20. ↑ St. Beuno the Wonderworker, Abbot of Clynnog, was uncle to St. Winefride of Treffynon, November 3, whom he also restored to life. 21. ↑ Almost all that is known of St. Boisol or Boswell, is learn from St. Bede (Eccles. Hist., IV, xxvii, and Vita Cuthberti). 22. ↑ The Mayo (Magh Eo, the yew plain), known as "Mayo of the Saxons". St. Bede writes of this monastery: "This monastery is to this day (731) occupied by English monks... and contains an exemplary body who gathered there from England, and live by the labour of their own hands (after the manner of the early Fathers), under a rule and canonical abbot, leading chaste and single lives." 23. ↑ Cædmon is said to have taken holy orders at an advanced age and it is implied that he lived at Streonæshalch at least in part during Hilda’s abbacy (657–680). Book IV Chapter 25 of the Historia ecclesiastica appears to suggest that Cædmon’s death occurred at about the same time as the fire at Coldingham Abbey, an event dated in the E text of the Anglo-Saxon Chronicle to 679, but after 681 by Bede. 24. ↑ Considered a local Saint by the Orthodox church of England but not formally canonised. 25. ↑ The proper name of Milton Abbey is the Abbey Church of St. Mary, St. Samson and St. Branwalader. 26. ↑ His [St. Cuthbert of Lindisfarne] body was still found to be untouched by decay, giving off "an odour of the sweetest fragrancy", and "from the flexibility of its joints representing a person asleep rather than dead. 27. ↑ Margery Kempe (ca.1373-ca.1439) stands very much alone in the English mystical tradition. Indeed, she is thought by some to be outside this tradition because of the lack of depth in her revelations, the highly personal level of her visions, and the extremes of her behaviour. If she is a mystic, it is certainly not in the same sense as her better known contemporaries such as Richard Role or Julian of Norwich. 28. ↑ "In the year of salvation 1677 this Temple was erected for the nation of the Greeks, the Most Serene Charles II being King, and the Roual Prince Lord James being commander of the foreces, the Right Reverend Lord Henry Compton being Bishop, at the expense of the above and other Bishops and Nobles and with the concurrence of our Humility of Samos Joseph Georgeirenes, from the island of Melos." - Inscription from tablet carved in Greek preserved on the west wall of the church Charing Cross Road. This site is now occupied by St Mary's of Kenton a non-Orthodox denomination. 29. ↑ From the series entitled "The Four Times of the Day". 30. ↑ In Hogarth’s time the portion of the street where the church stood was called Hog Lane. It was later renamed Crown Street and was demolished when Charing Cross Road was widened. Article published in English on: 30-1-2010.